Christie’s contemporary art auction set a record this week of US$495m whilst Sotheby’s brought in US$293m. A few days earlier their sales of Impressionist and Modern art had also brought in hundreds of millions. The New York Times has recently decided the Federal Reserve Chairman Ben. S. Benanke is now a major patron of the Arts and his policy of quantitative easing has indeed created a mass of liquidity which finds its way into the art market. The middle and lower ends of the art market is struggling but the top end is being jet propelled. When Bernanke finally turns off the taps what happens is anyone’e guess but until then the party is likely to continue. Low interest rates send investors looking for capital appreciation or income whilst uncertainty created by tax havens opening their books sends capital back onshore and looking for a home. At the Impressionist sales the Russians were out in force as they are becoming more confident in branching out from solely buying Russian art. Paul Cézanne’s Les Pommes went for US$41m against an estimate of $25m–$35m, and Amedeo Modigliani’s L’Amazone made US$25m, within its estimate of $20m–$30m. The Russians bid on works by Wassily Kandinsky, Chaim Soutine, Edouard Vuillard and Vincent van Gogh and were successful with Pierre-August Renoir’s Vase de Pivoines. The Soutine was Le Petit Pâtissier of 1927. It made US$18m, within the estimate of $16m– $22m, and is believed to have been bought by a Chinese collector. At the Contemporary sales there were exceptional prices paid for works of every decade from the 1940’s onwards with new records for Barnett Newman and Gerhard Richter. The rooms overflowed with financiers, hedge fund managers, venture capitalists all fighting over the spoils. The Russian sales in London at MacDougalls, Christie’s and Sotheby’s are at the end of this month. There is a wall of capital in Cyprus waiting for exchange controls to lift which will be looking for a new home. 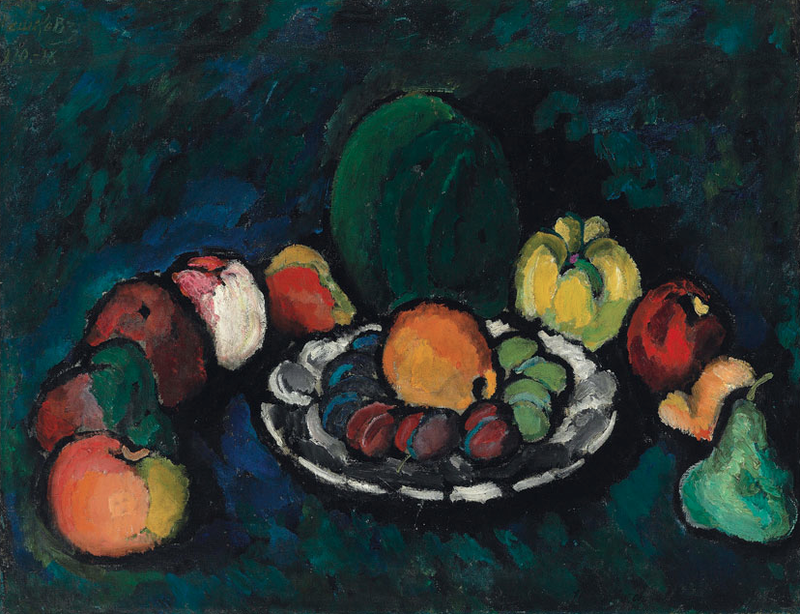 Prices of Russian art available privately are high and going higher and the best paintings in the London auctions should do well(such as the rare Mashkov still life – Ilya Mashkov (1881-1944) Still Life with Fruit, 1910. Oil on canvas, 103 x 133.8 cm. Estimate: £1,000,000–1,500,000 /$ 1,500,000 – 2,300,000). Soviet period art, still mysteriously ignored by the auctions, is developing traction in the private market and now has some leading Russian collectors chasing it. Record prices for 12 contemporary artists including Jackson Pollock, Roy Lichtenstein and Jean-Michel Basquiat made history on Wednesday night. The sale of postwar and contemporary art at Christie’s in Rockefeller Center totaled $495 million, the highest sales figure at any art auction. Even the pros were reeling. “It shows how broad the market is — as in deep pockets,” said the dealer Larry Gagosian. Of the 70 works up for sale, only 4 failed to find buyers. The evening soared far above Sotheby’s sale of contemporary art on Tuesday night, which brought $293.6 million. Even though Sotheby’s managed to set records for artists like Barnett Newman and Gerhard Richter, that was not enough to fuel bidding on other works of art. At Christie’s, one of Pollock’s classic drip paintings — “No. 19, 1948” — won the top price of the night, a record $58.3 million with fees. Four telephone bidders went for the painting, whose entire surface was covered with layer upon layer of delicate drips, and it finally went to an anonymous bidder through Brett Govy, chairman of Christie’s postwar and contemporary art department worldwide. Owned by the Washington industrialist Mitchell P. Rales and his wife, Emily, it had last been at auction at Christie’s in May 1993, when it was bought for $2.4 million by François Pinault, the luxury goods magnate and collector who owns Christie’s. Several years later, he sold it to the Raleses. That seemed modest compared to “Dustheads,” Basquiat’s seven-foot-tall canvas from 1982, depicting a pair of masklike faces punctuated with the artist’s signature graffitilike scrawls. It sold to a telephone bidder for $48.8 million with fees, also a record price. (The last record, set at Christie’s in 2012, was $26.4 million.) The painting had been estimated to sell for $25 million to $35 million and was being sold by the London collector Tiqui Atencio, who bought it from the dealer Tony Shafrazi in 1996. Another painting from the Williams estate, de Kooning’s “Untitled XVII,” from 1984, a large canvas of abstract ribbons of orange, blue and yellow, sold for $8.6 million, or $9.7 million with fees. Williams had bought it in 2003 for $3.7 million at a Christie’s auction. “We are in a new era of the art art market,” he said.